​ North Creek Forest ! If you are a first time FNCF volunteer, please complete and bring this waiver form with you to the event. Completing this form before arrival will expedite the sign-in process. ​Note that parent signatures are required for volunteers ages 17 and under. Now that North Creek Forest has been purchased by the City of Bothell, many people are asking what's next? ​ In 2011, Friends of North Creek Forest made a promise to the City of Bothell to continue our partnership after the entire forest was saved. And while the completed purchase is a tremendous achievement, the work is not done. ​In fact, in many ways, the most exciting part lies ahead! 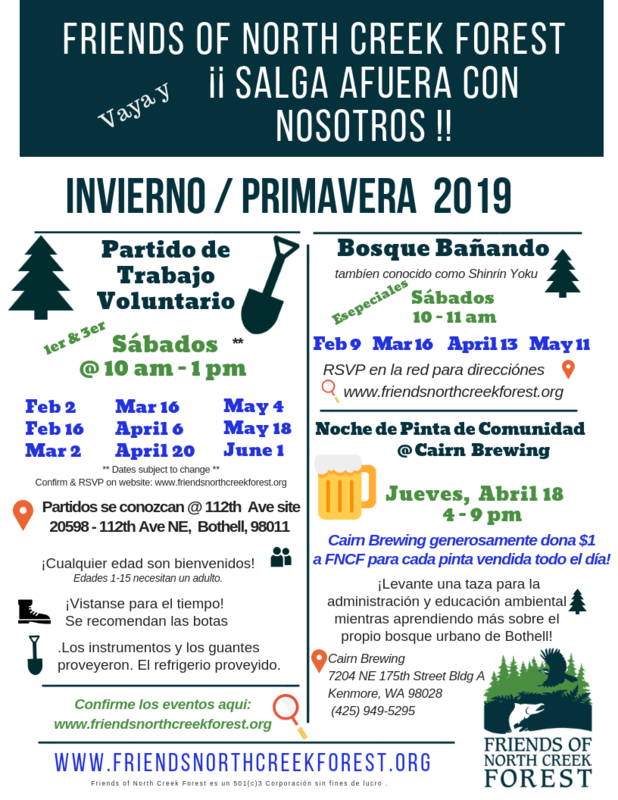 You have the opportunity to be a part of this continued partnership by getting involved and supporting Forest Education programs that enhance and honor nature relationships, build a healthy forest, and develop a resilient community that can respond and adapt to our changing climate and world. 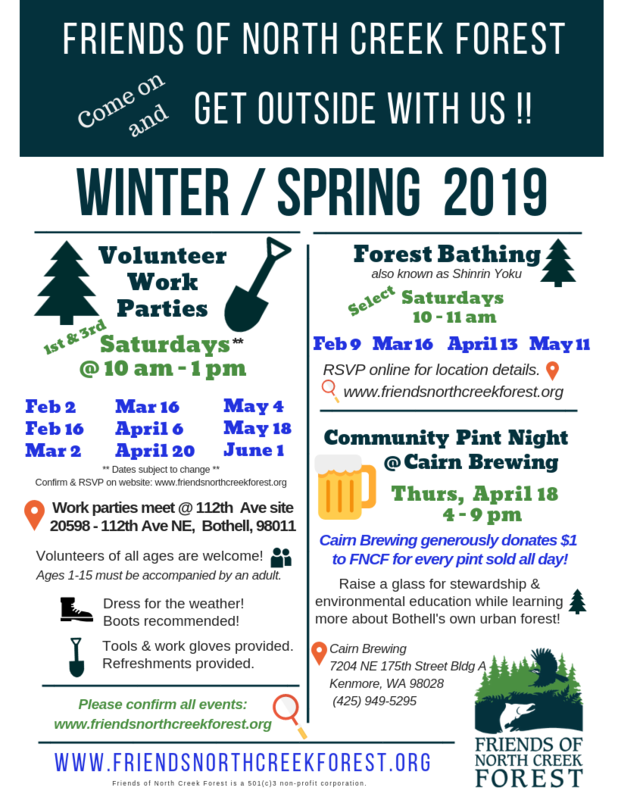 Visit the Forest – Connect with nature at one of the community programs listed below, or come out to the forest at 20598 112th Ave NE, Bothell, WA 98011. Please note that there is not an established trail system at this time. The forest has nine wetlands and seven streams that filter water and protect habitat for endangered salmon living nearby. It is home to over 100 plant species, and a diverse array of wildlife. The forest provides inspiration for art, science and literature across all generations. Friends of North Creek Forest provides forest education and outreach: hundreds of school children visit the Forest each year. FNCF engages the community: over 500 volunteers contribute 4000 hours/year. FNCF also restores forest edges and maintains the quality interior habitat and provides opportunities for college students working towards careers in environmental science, education and policy.